This block provides an alternative user dashboard for learners. What does this block do? 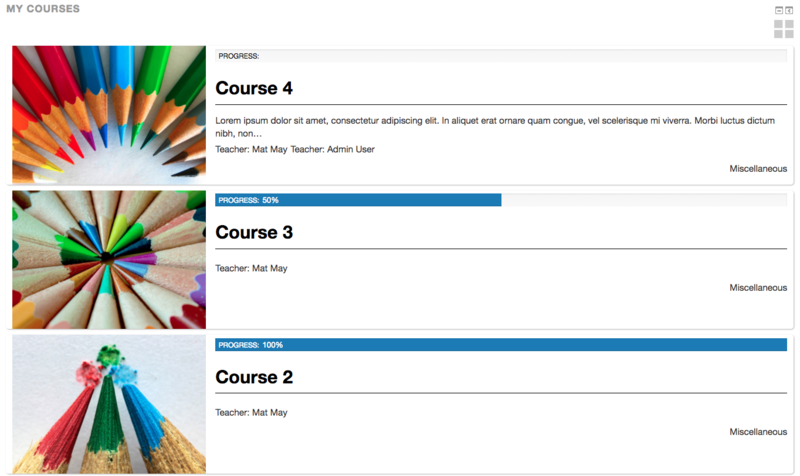 This block provides users with a dashboard that shows their enrolled courses and progress throughout the course if there is course completion enabled. This block does not appear either in my frontpage or course area of my LMS. I have Moodle v3.1 and used Adaptable theme. I installed a clean 3.1 with adaptable and found that the block is working as expected. Hi there, somehow I can only add blocks in the sidebar! What am I doing wrong? Hi! We are currently using the My Courses block. I'm setting the progress bar yet it doesn't work. Can you assist me please? I am having a couple of problems. I love the look of this block. It talks about two layouts, but I don't see how to change between the two. I only have the vertical list layout. I would like to use the horizontal bar layout. Also, my course shows the picture, the description and then says "unset". What field is it looking for? Thanks! I found the answer to both questions! Thanks, anyway! Blessed day to all! The plugin is quite cool. Mostly the layouts. Thank you and congratulations on a great plugin ! The only limit I could find is that the course summary section does not support multilang filters : I would really like it if users could read the course summary according to their preferred language, (in this case, either French, English or Mandarin Chinese). Is there any way you could do something about this ? Thank you for the kind words. I have had a play with the multilang filter system and worked on a solution. Any trick to fix that ? Thanks again for helping and congrats on a great job ! Hi again, another solution for the above mentioned problem might be to allow for a zero character-long course description (i.e. no description shown in the dashboard). This would prevent the Generico code from appearing within the dashboard course descriptions... Thanks for helping ! It shows all the students as teachers. How to fix that?